For large incumbent organisations looking to reinvent themselves, it’s not a case of simply flicking the switch on “the way things have always been done around here”, donning white shirts, red ties and embracing a, dare I say, Trumpian approach to innovation. Culture, mindsets, processes, systems, performance incentives and values at large organisations can often be the very antithesis of innovative thinking and if I’m a senior executive whose success has been pegged to having what appear to be the right answers, mitigating risk and maximising shareholder value and my core business is still, after all, making money today, then the prospect of genuinely moving from delivery to discovery for most large organisations is a grim one. ‍But it is not without its remedies. ‍Incumbents can attempt to re-design or create parallel processes and systems internally to support exploration but need to ensure that it doesn’t compromise the delivery of the core business. They can carve out a new business unit to deal with disruptive innovation, create spin-offs or spin-ins or they can invest in, partner with or acquire startups. The latter approach is indeed the most straightforward and popular one with technology M&A deals in the United States alone totaling US$42.8B across 486 investments in Q1 2017. Globally, corporate venture capital participated in US$24.9B across 1,352 deals in 2016 with seed and Series A investments accounting for almost half of this so clearly large incumbents see startup investment as a significant part of their growth strategy. 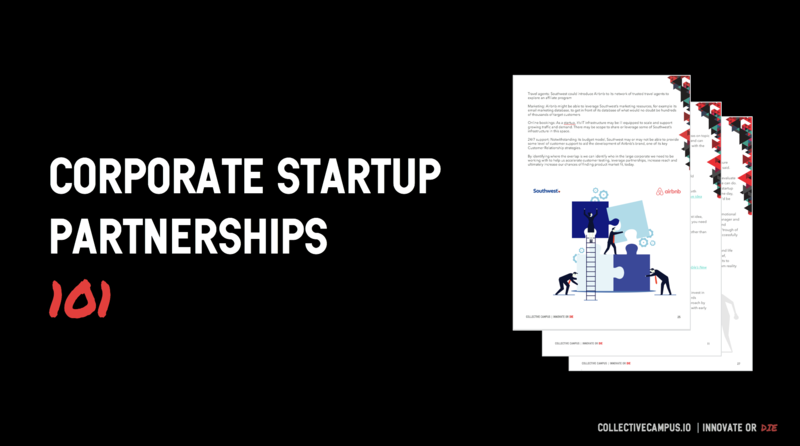 This ebook provides an overview for executives at large organisations on how to identify, connect with and successfully partner with startups.